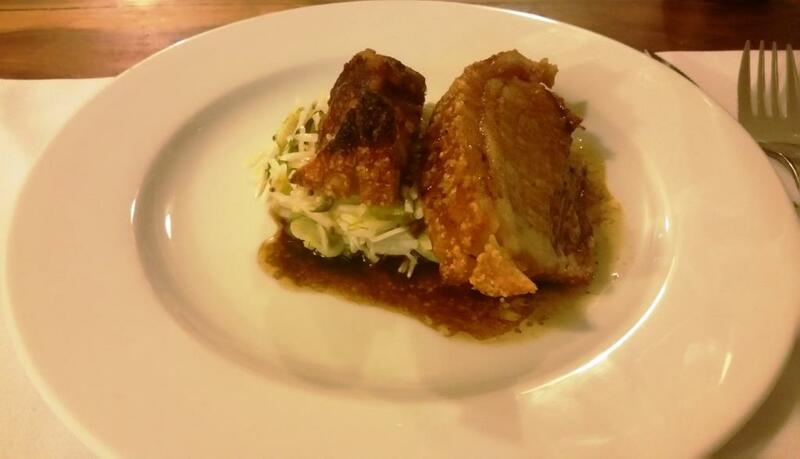 There are few things greater for a fat adapted person than crispy, glass like, pork crackling and this recipe for roast pork belly has never failed us. 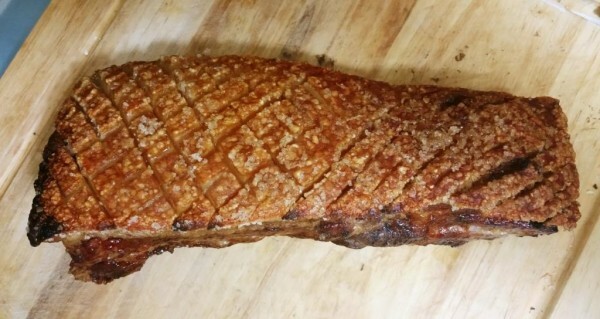 We bought a slab of Pork Belly from our local bulk buy store (CostCo) the other day and sliced of 2x2kg (4.4 lb) blocks to be cured to make bacon and we had this little bit, maybe a 1 kg slice, left over so we decided to Roast it. The Bacon recipe will have to be another day … it’ll take at least a week to cure and then we’ll smoke it. Mmmmm. 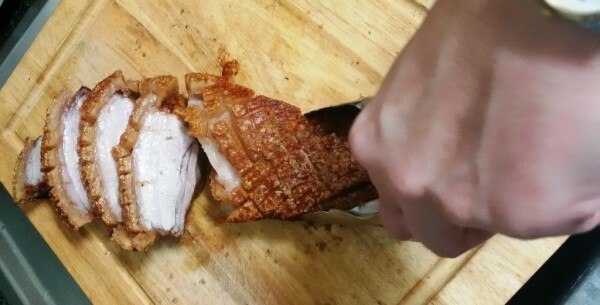 But in the meantime we’ll slice of a little taste tester to make into some pork crackling. 1 kg Raw Pork Belly You can use more, just need to get more pans. 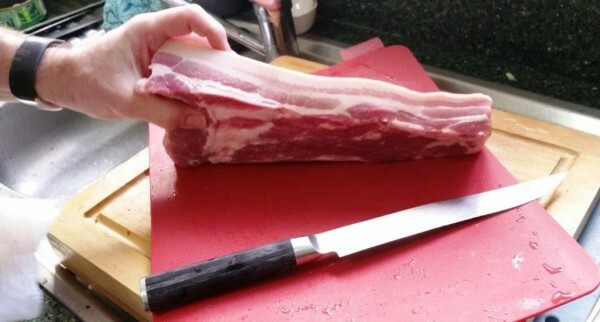 Slice Pork Belly to a slab large enough to fit in your pan, and score the skin side every 1 cm in a cross hatch pattern (see the finished piece where the scoring pattern is more obvious) with a sharp knife down to the beginning of the flesh level. rub the skin with the olive oil making sure to push it into the scores. Then Salt the skin liberally and again push it into the cracks. Halve two small onions to use as a trivet to elevate the pork belly so that hot air can move around it and liquid can fall off it. 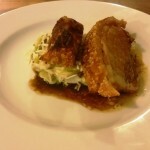 Place the pork belly on the onions skin side up. Now turn down the oven temp to 180C ( 350F ) and cook for 90 minutes. 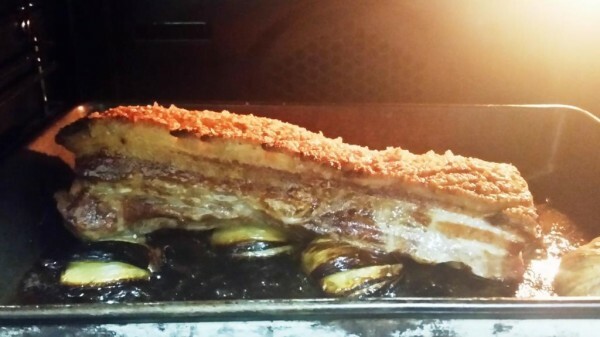 Remove the pork belly and rest it on a board for 5 mins. 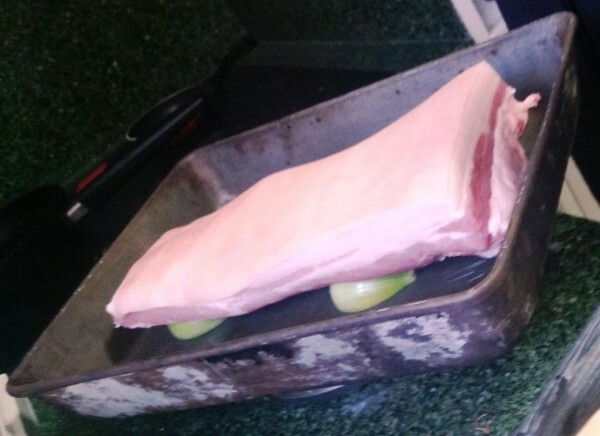 You can now slice the pork belly up into portions, and use what is left of the onions and the pork juices at the bottom of the pan to make a Jus. We added a small amount of sugar free maple syrup - special ingredient.